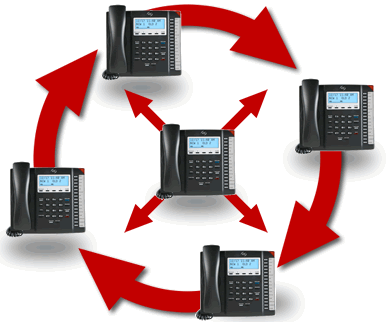 Join together up to 100 compatible ESI phone systems into one interconnected, IP-based system. Esi-Link from Action CTI uses your WAN or the Internet to join together up to 100 compatible ESI phone systems into one interconnected, IP-based system. ESI’s exciting Esi-Link (“easy-link”) technology helps you unite your team members, whether they’re a street, a city or a country apart. Esi-Link from Action CTI uses your WAN or the Internet to join together up to 100 compatible ESI phone systems1 into one interconnected, IP-based system. While ESI wasn’t the first company to offer a multi-site solution, it was the first to offer one that unites the many advantages of multi-site communications with the unique, high-performance features of ESI business communications systems. As the name implies, Esi-Link is amazingly easy to use. For just one example: let’s say you want to call an extension at another one of your locations. Up to now, you’d have had to make a regular phone call (and run up the charges associated with that). But, with an Esi-Link-enabled ESI phone system, simply dial the extension2 just as you would if it were right down the hall, instead of miles away — perhaps even thousands of miles away. And this all happens over your data network; so, if you have additional lines (especially expensive dedicated phone lines), it’s even easier on your bottom line than it is to use. Quick, easy access to remote systems — Esi-Link lets you easily communicate with people at your remote locations without having to remember complicated codes. Just dial the desired extension. Yes, it’s really that simple! Toll bypass — With Esi-Link, you may well be able to eliminate altogether your need for expensive dedicated lines interconnecting sites. Esi-Link communicates by using available bandwidth on your existing WAN or the Internet to complete the call, substantially reducing the need for, and associated cost of, public telephone network circuits (whether voice tie lines or dialup). It also can lower long-distance expenses by letting you call from a remote location’s local dial-tone (e.g., if you’re in The Woodlands, Texas and want to call someone in Houston, just press a key to access local dial tone for your Woodlands office’s Esi-Link-enabled ESI phone system so you can place the call as if you actually were in The Woodlands). Fully featured, cross-platform phone communication — With some systems, you might have to give up lots of features to enjoy the advantages of VoIP; but Esi-Link lets ESI systems share a full range of ESI advanced business phone features that work uniformly across the network. Also, an Esi-Link network has cross-platform integration — meaning it can include both traditional and VoIP-based ESI systems. That means more of your people can make multi-site calls; it also means they can keep using the ESI phones and systems with which they’re already comfortable. Capacity that fits your needs — Some businesses or organizations have only a small number of sites; some have many. Esi-Link connects as few as two — or as many as 100 — ESI phone systems. And a two-site Esi-Link network has all the features of its 100-site counterpart (or a site of any capacity in between). Publishing — Each Esi-Link-enabled IP PBX (of which there can be up to 100 on an Esi-Link network) can “publish” (transmit) to the network the status of any combination of up to 30 extensions, voice mailboxes, and department groups. That means that, when you assign one of these items to a programmable feature key on your ESI phone, the key’s indicator lamp works just as it would if you’d assigned to the key a number within your own local ESI system. One look at the keypad and you’ll know whether Dave in the cross-town warehouse is on the phone (or, for that matter, has set his ESI phone to “do-not-disturb” mode). Clearly, this is one of Esi-Link’s most powerful, time-saving, and productivity-enhancing features. Speed-dialing across the network — The Esi-Dex speed-dialing capability already in place on ESI phone systems gets smarter still with Esi-Link aboard, because now it can also speed-dial extensions at remote locations. Esi-Dex’s Location Dex feature makes it, well, easy to look up and speed-dial any remote extensions. If you can tap on a scroll key and read a big, clear display, you can use it. Each office’s network configuration is different, so consult Action CTI for more complete details on putting Esi-Link to work for you. IP stands for Internet protocol.  Esi-Link is available only from Action CTI with ESI IP factory training. Product specifications and features subject to change without notice. To support certain ESI Communications Server features (including IP-related ones such as Esi-Link), the ESI-50L Communications Server must be upgraded to an ESI-50. Contact Action CTI for more information.